Under the hot Aussie sun, a house roof will deteriorate. Hailstorms, windstorms and UV all damage Sydney roofs - the sun eventually causes tiles to shatter and crack from the constant expansion, and the cement and mortar is turned to dust. Perhaps just had your house renovated; now your roof looks hopelessly out-dated. An old, faded and unfashionable roof will reduce your property value. Tandem Trades - Expert metal re roofing specialist, is chosen by builders because we are a flexible, reliable partner specialising in Colorbond and Zincalume metal roofing and flashings . We provide realistic quotes, we are efficient and professional, and we clean up the site afterwards. Tandem Trades pride itself on being able to deliver quality jobs on time with a minimum of fuss. Architecturally designed buildings that require high quality workmanship with attention to details is the type of work that we love to add to our portfolio. Polycarbonate sheeting is used in a variety of ways. Although it is transparent, it reduces UV penetration. It is used over sundecks, over carports, and over pool areas, to allow light to penetrate. There are a large range of colours that all have different characteristics in the way they deflect heat and allow light in. 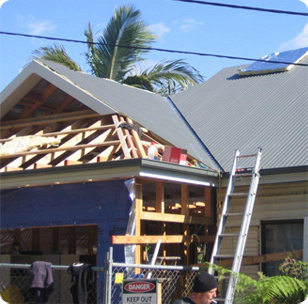 We offer new metal roofing, roof repairs, re-roofing, and roof ventilation services throughout the greater Sydney area including Sutherland Shire, St George, Inner West and the Eastern Suburbs Sydney for all residential, commercial and industrial customers.